Considered one of the Top 3 ballets to see (along with Swan Lake and Romeo & Juliet), Giselle tells the story of a peasant girl who descends into madness and ultimately dies of a broken heart after learning her beloved is actually promised to someone else. 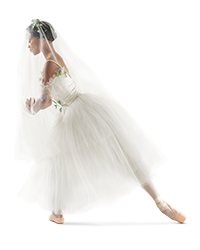 With elements of the supernatural and incredibly technical and emotional dancing, Giselle is visually stunning and dancing the lead is a coveted role for many ballerinas. Virginia Pilgrim Ramey and Brandon Ramey will dance the leads of Giselle and Albrecht, respectively. Crystal Brothers, in her last mainstage performance with Ballet Memphis, will dance the role of Myrtha, queen of the Wilis (the spectral virginal brides who dance ne'er-do-well men to their deaths). Brothers will retire at the end of this season after a career with Ballet Memphis that goes back to 1996. In this interview, Ballet Master Brian McSween discusses Ballet Memphis' new staging of the classic, and Virginia Pilgrim Ramey talks about her first time essaying this "bucket-list" role.